WHAT IS VERSUASIONS & HOW IT WORKS? 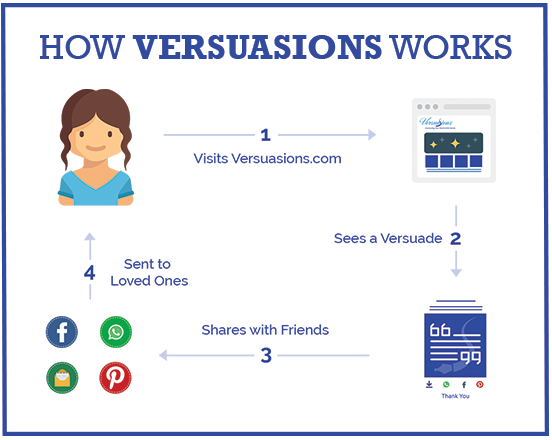 Versuasions is a new online way to express and tell your loved ones that you care. It’s an internet-based-portal which offers a touching and emotional product (coined the Versuade) allowing self-expression creatively across the web. An expression is an act of communicating one’s thoughts or feelings to others and Versuasions lets you find a sense of “flow” while expressing innovatively. This new innovative online platform also aims to regain public interest in the lost art of expression. The objective will also bring about an alternative way people connect with each other. Team Versuasions refer to their product as “the Versuade” whereby the USP is its expressive content. A Versuade is a combination of two words verse and persuade. The team selects and arranges various elements of art so that they merge perfectly to achieve the expressive objective. 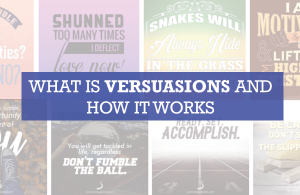 Versuasions’ mission is to connect people globally with words so that all can experience and convey different sentiments. Customers will be offered a unique portal via the internet to connect faster through multiple devices; downloading, sending or sharing the Versuade. Versuasions aims to be the purveyor of human emotions demonstrating love, warmth and care through innovative, authentic and quality expressions. It’s akin to a gift which has the power to express all human emotions, be it love, humor or admiration. A Versuade will bring in much warmth and joy to both the sender and receiver. What a better way to tell someone that you care or understand their plight! 2. Select an appropriate Versuade. 3. 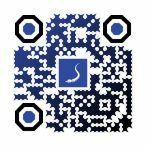 Now you can download, send or share to a loved one’s mobile device or social media platform. (Facebook, Whatsapp, Instagram) And if a social media profile has yet to be established, a Versuade can be shared by sending through as a sms. 4. Now your loved one can cherish A Versuade at any point in time. The modus operandi is clear: To give customers a portal used to display intimate emotions using their most intimate devices (smartphone or computer). By doing so we save a customer’s most precious commodity. Time! No need for a store visit. No need for a stamp purchase or a walk to your nearest post office. This is the problem which shall be addressed. Remember Versuasions will always think, customer first. Versuasions is set to be a great option for those tech-savvy people around this marvelous globe. It will serve to be a convenient option for those who don’t have the time it takes to “express” accordingly, while thinking addressing lovable concerns locally, nationally and globally.